Tying our Trout & Salmon Flies - Have we been tying them upside down? Two wet flies are shown below. Which one is dressed upside down? Now before answering this question, I would suggest that you go immediately and run a bath. Run a foot or so of water. While the bath is running, go to your fly tying station and gather as many different shapes and sizes of single hook as you can lay hands on (you might also gather a few doubles as well just for good measure). Take also a length of about three feet of fine fly tying thread. Take the assembled hooks and thread to the bathroom and turn off the bath. Now take each hook in turn, thread the fly tying thread through the eye of each hook and even up the ends of the thread. Now you have a doubled length of thread about 18 inches long with a hook on the end. Drop each hook, so attached, in turn into the bath and pull it through the water. I expect that your experiments, like mine, will show that most single undressed hooks, and doubles for that matter, when pulled through the water, swim naturally with points upwards. Is it logical, then, to dress our wet flies (we might exclude dry flies from our considerations here as their dressing is subject to different criteria) so that they swim "upside down", i.e. contrary to their natural tendency to swim with hook points upwards? What advantage do we gain by so doing? I must say that no immediate advantage springs to my mind. It might be said, certainly, that the conventionally dressed fly above "looks better". It does to me, but I suspect that this is due merely to traditional custom and practice, to a preconceived notion of how a fly should look. 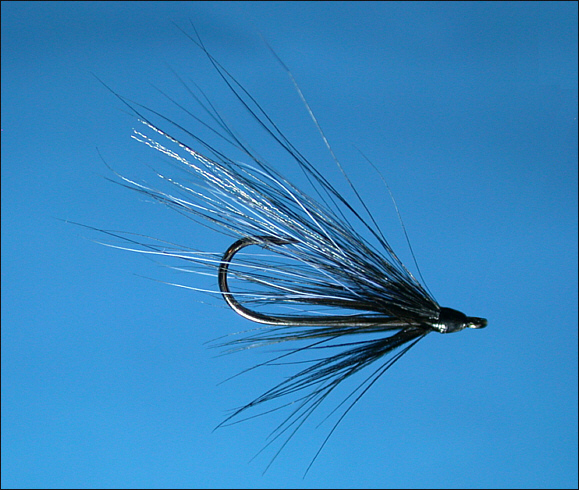 Certainly there can be no denying that wet flies dressed in the conventional manner work. Furthermore, it might be said that, if dressed, as most flies are, with the bulk of the dressing on the side opposite the hook point, the fly will normally swim, as the dresser intended, with hook point down, the buoyancy of the dressing overcoming the natural physical tendency. On the other hand, is there any advantage to be gained in dressing our single and double hooked flies in line with their natural tendency to swim with hook points up? I think that there may be. For example, would the hook point on a fly dressed in the manner of the second fly above not be more easily hidden among the fly dressing, and therefore less conspicuous to a fish? Would the hook point, swimming on top of the fly, not be less easily damaged on a rocky riverbed, or less easily caught up on riverbed weed? 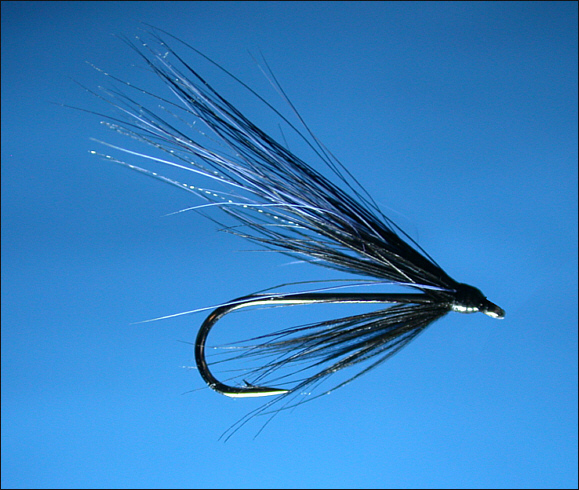 Would a fly so dressed not be more stable in the water, the orientation of the hook assisting, rather than opposing, the fly's natural equilibrium, especially in a rough river current? In short, then, why have we, for centuries, dressed out wet flies upside down?